How many people are currently on your email list? When was the last time they heard from you, and what is your open rate? If you have no idea what I am talking about, then listen up! In the online world, the success of your business is dependent upon the strength of your email list. This is well known among most online businesses that are very successful. Having a solid email list allows you to get your brand in front of more people, on a consistent basis. This is extremely important for when you want to sell something such as a course, services, or your affiliate links. If you are an online wellness business, then it is extremely important to have a strong email list so you can stand out from the crowd of other online wellness professionals. You have direct access to your audience by placing your content directly in front of them on a weekly basis. If you want to learn more about building consistent content, go back to episode 2 to learn more. What about the new Facebook Algorithm? The other week Facebook announced that they were going to make the newsfeed more about community, so they would show you more posts from your friends and family. This put a lot of businesses in panic mode as they were worried about what this means for their businesses. I talk through my opinion about the algorithm change and how to work with the new changes to optimize your business. 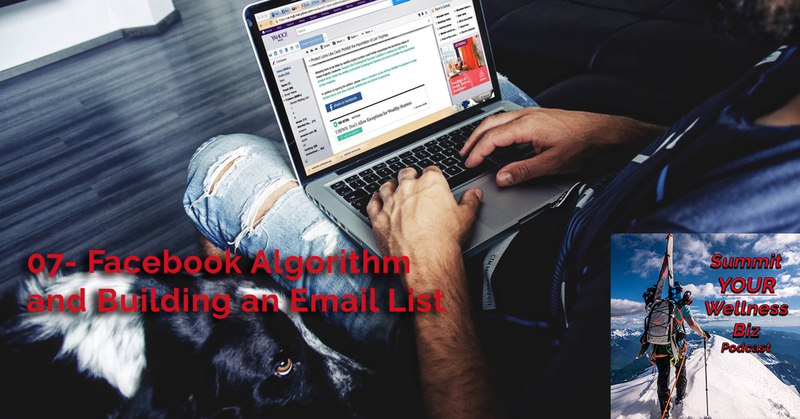 Even if you only have 1 person currently on your email list, it is important to start building up your list. Make this a priority within your business, and see if you can increase your subscribers in the next month by 10%!